M&M Meat Shops is proud to be Canada's largest retail chain of specialty frozen foods with locations coast to coast. They offer a delectable selection of more than 375 mouth-watering products. You'll find your trusted family favourites plus exciting new tastes to satisfy the most selective palates. And, the majority of their dishes are ready to thaw-and-serve or heat-and-serve to make meal prep easier for you. 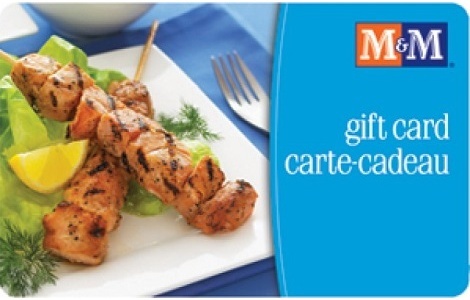 Present this gift card as payment towards your purchases at any M&M Meat Shops location in Canada. This card has no value until activated and is not redeemable for cash. Each time you use this card, the amount of your purchase will be deducted from the balance remaining on the card. Lost or stolen cards will not be replaced. The remaining balance on your card will appear on your receipt or you can check the balance by visiting our website at mmmeatshops.com.